Introducing Disney inspired Decorative Cushions that bring a smile to your little one's face and ensure ultimate comfort while sleeping. These add a magical touch to your toddler's bedroom and are ideal choice for both girls and boys. These fun and exciting range of Disnety-themed cushions will definitely be loved by kids. 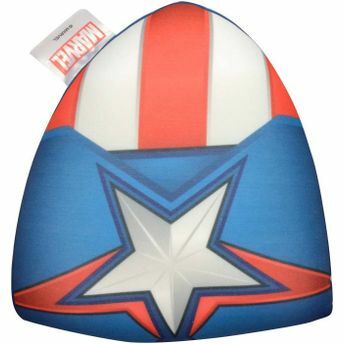 The attractive Captain America Logo Print is a must pick for your loved one. Additional Information: Bring fun and excitement to your little one's life with exciting Disney character merchandise. The Disney Consumer Product range includes Decor and Accessories, Hand sanitizers, Deodorants, Nail Polishes and many more products in various Walt Disney Characters, all available in attractive packaging that appeal to fans across ages.